Stock market close price is an important piece of information that is very useful for every short-term trader. The close prices are very important, especially for swing traders and position traders. It also has implications for practical day trading in many day trading systems. There are several ways to monitor stock market close. It is possible to check only close prices on some online websites that provide this information. Another possibility is to check live or delayed price charts. Such charts are available in any good charting software but it is also possible to use charting features of good market websites. There are more types of price charts. The last i.e. close price can be charted using line charts, but this is not a very usable option. The best option is to use candlestick charts. Candlesticks provide a lot of information that can be used for analysis, research and trade management and stock market closing price is among them. The stock market close price level provides very important information about the general mood of investors. It tells a lot about the thinking of big investors that allocate large amount of money into the stock market for their asset management purposes. It is known that big investors use the last few trading hours for their positioning. I am not sure if it is mentioned in materials during typical training but big price moves happen by movement of big asset allocators – like big mutual funds, big insurance companies, hedge funds, etc. And it is known that they prefer to arrange their decision in afternoon trading just before the stock market close. They want to increase buying or selling during the last couple hours of trading. We as smaller traders want to know what these big investors do. And it can be seen by monitoring stock market close prices. You can check close price of any major index if you want to know the broader intentions of global investors. And it is possible to monitor just the closing prices for any particular stock or sector to analyze behavior of investors in reference to this individual share ticker. Is there heavy buying into the market close? Are investors bidding prices all the way up to the stock market close? This is a sign of very bullish investor opinion about these particular shares. It could be quite safe to buy these shares too. Especially if you have already prepared some online trade setups in advance and are already monitoring share price movements during the day. The day traders use such bullish close of the market to allow some holding of their position to the next day. The typical expectation is that shares with strong buying interest into market close could be trading much higher the next day immediately from the open. Some of these day traders or short-term traders would also use premarket trading hours to close trade and make profit based on such expectations. The opposite is true for stocks or sectors where a weakness emerges in the last two hours before market close. These shares prove to be sold by big money managers. This can be good if we plan to have some short sell trade with these shares. But it should be a warning sign if we hold long (bullish) positions in such a symbol. Exchange traded funds are different equities that are traded on US exchanges. Although they are also traded and their prices move with buying and selling, the calculation of fair price for any exchange traded fund is little bit different. These ETFs typically represent some basket of stocks that they hold in a portfolio. So the fair price of an exchange traded fund is calculated intraday and also on closing basis. This fair price is based on prices of stocks in the ETF portfolio. The value of such exchange traded fund is known as NAV (Net asset value). It can be a little different during a trading day. But final closing price should not be very far from calculated NAV. But you can find some exchange traded funds where you can find quite a significant difference between stock market close price and final NAV for the trading day. These exchange traded funds are mostly very illiquid and very thinly traded. 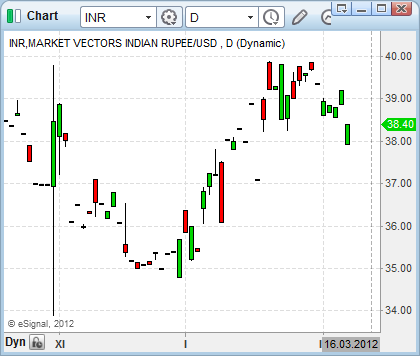 The example above shows currency ETF for Indian Rupee that is not traded too much. Its daily trade volume is very light. 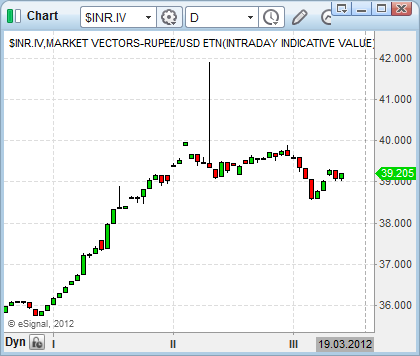 So it is much better to monitor the price chart of its NAV value that is automatically calculated every trading day.